Nominations are now open! Please nominate for the Top 250 Latino Agents Award for either individual or teams. Honoring the top producing Latino agents in the U.S. The National Association of Hispanic Real Estate Professionals (NAHREP®) released its seventh annual Top 250 Latino Agents Report today recognizing outstanding Latino real estate agents from around the country. With aggregate sales of more than $4 billion, this year's list highlights agents that hail from 30 states and Puerto Rico. It includes rankings of top millennial agents, top individual agents by volume, and top agents by major market regions. Also, for the first time, the NAHREP Top 250 recognizes the top Latino-led teams. "Hispanics are driving growth in the real estate market at all levels," said Daisy Lopez-Cid, NAHREP President. "It's a privilege for NAHREP to recognize the agents and teams that are making a massive impact in their respective markets and facilitating the dream of homeownership a reality for thousands of families." Nominations for the Top 250 came from every major market in the nation, with Chicago, El Paso, San Antonio, Las Vegas, and Austin leading the way as the most represented cities on the list. The top 250 agents were selected based on their total transactions and total volume for 2017, verified by NAHREP and other third-party sources. For the fourth consecutive year, RE/MAX was the most highly represented brand, with 75 agents on the list, followed by Century 21 with 46 honorees and Coldwell Banker and KW with 20 honorees each. Most of the agents on the NAHREP Top 250 are much younger than the typical agent, according to National Association of Realtors' statistics, with the majority of the agents on the list being in the 36-to-51 age bracket. The Top 250 Agents will receive special distinction at the 2018 NAHREP National Convention at L'ATTITUDE, and the Top 10 Agents will be publicly recognized at an awards ceremony at the convention on September 8 – 11, 2018. NAHREP takes all nominations into consideration prior to announcing final results. In addition to broker attestation, sales data submitted is independently verified for accuracy and consistency with reporting methodology. 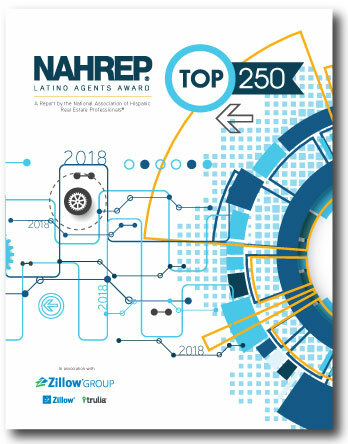 In addition to the highest ranking agents based on sides, this year's report examines agents per geographic region including the South, West, Northeast, Midwest, and Texas, agents and teams by respective transaction volumes, Millennials, and for the first time, NAHREP Top 250 recognizes the top Latino-led teams.